Video interviews, panel discussions, articles and Q&As featuring Dave Evanson. We’re joined by Andrew Rosener, Dave Evanson and Shane Cultra. Domain Name Liquidity: What is It, Where Was It, Where Will It Be? DNSeattle took place on Thursday, May 12, 2016 at GoDaddy’s headquarters in Kirkland, Washington, just North of Seattle — and raised more than $5,000 to help find a cure for cancer! 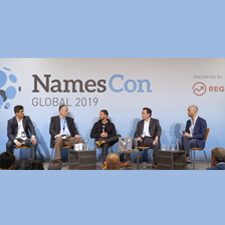 More than 90 attendees met, networked and learned about domain name liquidity during this live panel session with Jeffrey Emerick (individual investor, Brand Bucket Ambassador), Dave Evanson (Sedo) and Joe Styler (GoDaddy). NamesCon wrote up a fantastic summary of the event, and is offering $299 NamesCon tickets ($300 off!) to DNSeattle attendees for their January 2017 event using the DNS299 coupon code. Get it now — see you there! And, special thanks to the Zandibot, Ali Zandi, for his mad skillz adjusting the audio of today’s show.